There are two main causes for having "spots" in your digital images. The main one is that dust is naturally attracted to the CCD. The second is that small metal slivers are created each time you change lenses and end up residing in the bottom of your mirror box. (This especially occurs when the camera body is new.) The first big step in keeping it clean is to do everything you can to prevent these two elements from reaching your CCD. For example, you can keep dust out by keeping a body cap on the camera whenever a lens is not attached. You can turn the camera downwards when a lens is not attached so that dust can't fall in simply due to gravity. You can carefully wipe out the small metal slivers from the bottom of the mirror box with a cotton swab. But inevitably dust eventually lands on the CCD, and you will have to clean it (I clean my CCD once or twice a month, at most). When this happens to me, I first set the camera to M exposure mode (refer to the specific chapter on your body). I then set the shutter speed to Bulb. Once this is done, I depress the shutter release, which pops the mirror up out of the way. Then I use a blower bulb to blow off the CCD (DO NOT USE CANNED AIR!). Once the CCD is clean, I let the shutter close and reset the exposure mode to A. I then take a photo of a wall, without a lens attached, and check my results. This past week, I had a major scare. I was a thousand feet up a steep mountain side photographing Dall Sheep. In the process of changing lenses, I accidentally hit the shutter release so the D1H took a picture. The problem was it was snowing and 2 snowflakes got into and landed on the CCD! When the snow melted, they left quite a mess on the CCD--the spots were horridness! I had two more days of shooting so I either had to commit the biggest no no of CCD cleaning and touch the CCD or not shoot (I was in the Yukon Territory with the nearest town being Fairbanks AK which was eight hours away!). 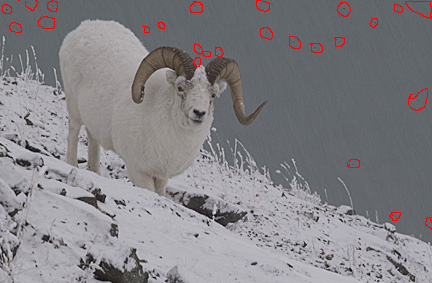 Dall sheep image with snowflake uglies highlighted. Not shooting was not an option..., so with my Petzel headlight on my head and blazing away, I took a Q-Tip and cleaned the CCD. It was a nightmare and took over an hour to get the CCD first cleaned of the melted snowflakes and then remove all the fibers left by the Q-Tips. I don't recommend this procedure to anyone, don't touch the CCD! The resulting images after the nightmare cleaning had no "dust" spots, but I never want to do that again! David adds: I've had great success blowing off my CCD the same way Moose does. The only thing controversial about it is using the Bulb setting instead of the mirror up custom function. The simple reason for this is that it is a pain to always carry an AC adapter in the field and have it there to plug the camera in. Some folks are concerned they'll accidentally close their shutter on the blower bulb. If you're worried about that--use the AC adapter. Other folks are concerned that having the camera on will attract more dust to the "charged" CCD. From the postings of some pretty technical folks on various D1 lists, I'm fairly convinced that is unlikely to be an issue. And certainly it is not an issue I've ever found to be a problem.